The Fenwicks Foaming Chain Cleaner is a simple, effective, easy way to clean your chain, without any harmful solvents or acids. It’s a foaming degreaser that strips your chain and cassette clean but is both environmentally sound and doesn't affect your bike's paintwork. Foaming Chain Cleaner is a real innovation in bike maintenance. Utilising Fenwick’s cleaning superiority, chain cleaning has never been so easy. Our Foaming Chain Cleaner makes chain cleaning part of your bike wash routine, instead of a laborious 2nd job that never gets done. With its simple mess free spray application there is very little waste as only 5 to 10ml of product is needed per clean and it is biodegradable too. Foaming Chain Cleaner does not use solvents or acids (citrus) to be effective, resulting in a safe product to use. 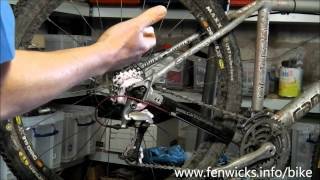 To make the process even easier just use a sponge to scrub the chain and a Gear Brush to agitate the cassette, jockey wheels and chain-set. The cleaner is biodegradable and safe to use on anodising, carbon, plastics, rubber and painted surfaces.